(Honolulu, HI)— Rainbows, Cupcakes, and Shave Ice are the stuff of any Instagram-enthusiasts’ dream. Turn those into desserts worthy of a few photos, and we’ve got Kulu Kulu’s new Sweet Aloha Collection. Listed below are the three distinctly Hawaii-inspired desserts and treats. The newest addition to the Kulu Kulu collection is the Shave Ice Cupcake. Exclusive to the Royal Hawaiian Center shop, the Shave Ice Cupcake is shave ice with homemade syrups and topped with freshly-made whipped cream, those familiar with the Kulu Kulu Shave Ice Cake are sure to welcome this small version of the original. Flavors include “Strawberry Short,” “Blue Hawaii,” and “Kona Coffee Tiramisu”; these frosty delights come in two sizes: regular (9oz, $4.95) and large (16oz, $6.95). 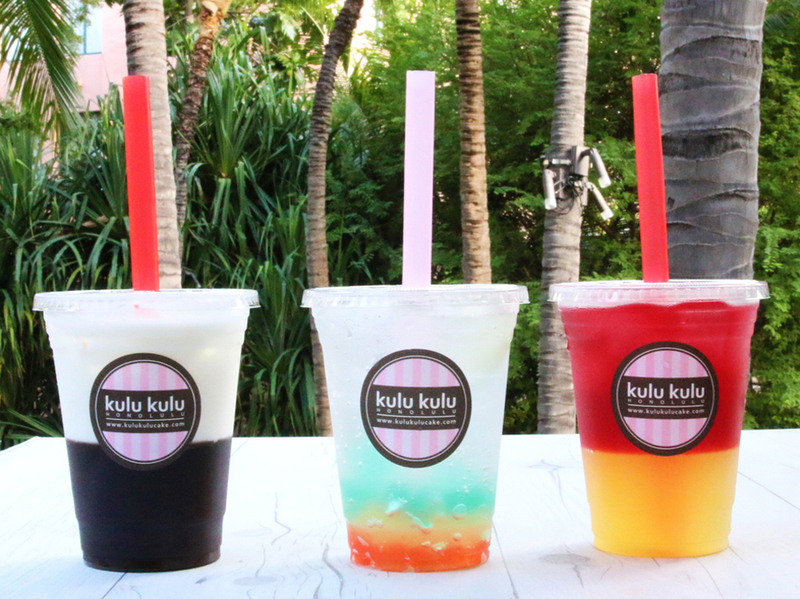 The longtime Kulu Kulu crowd-pleaser jelly-based drinks are rebranded as Aloha Jelly. While all are popular, the Rainbow Soda ($5.95) has quickly become a Waikiki must-have. Exclusive to Royal Hawaiian Center, this drink is a refreshing mix of colorful jelly and lime slices floating in soda. Each color has its flavoring: red is hibiscus, yellow lilikoi, and blue mint. The well-loved Kona Coffee Latté ($4.25) comes with the option of whole milk, or soy milk at no extra charge, and the Lemonade Hibiscus Tea ($4.25) is favored by those that love a refreshing tea. The Rainbow cake is available in slices ($4.50) or as a pre-ordered 7” whole cake ($36) at all Kulu Kulu locations. Other rainbow whole cake sizes (and shapes) are available as custom orders as well. Auwe! We found an error in our previous release.